Juvederm Vollure is a hyaluronic acid facial filler, specifically designed for the nasolabial folds and for the parenthesis around the mouth. This is the longest lasting dermal filler on the market for the mid-face, lasting up to 18 months. Before Vollure, Juvederm was used to treat these mid-face areas, but Vollure uses what is called Vycross Technology, allowing the injector to contour the injected area and provide longer lasting results. JUVÉDERM® Vollure XC filler smooths moderate to severe lines and wrinkles associated with the normal aging process specifically around the mouth and nose. Injected deep into the facial tissue, it smooths wrinkles and folds by temporarily adding volume in the parentheses or nasolabial folds. The treatment will give you a subtle but remarkable result with lasting effect, up to 18 months. At Derma Health our approach is a naturally refreshed look (never over-done) so everyone will notice, no one will know. This filler product, JUVÉDERM® Vollure XC has a small amount of lidocaine mixed in for an anesthetic effect, improving the comfort of the injection. JUVÉDERM® Vollure XC is a colorless hyaluronic acid injectable gel. Hyaluronic acid is a naturally occurring sugar found in the body. The role of hyaluronic acid in the skin is to deliver nutrients, hydrate the skin by holding in water, and to act as a cushioning agent. Who is/is not a good candidate for Juvederm Vollure? Where on the body can Juvederm Vollure be used? The product is most often used in facial tissues to smooth folds and wrinkles. The most common areas are the parentheses lines near the mouth and nose (or the nasolabial folds). This filler may also be used in other areas of the face, such as perioral lines, lips, chin, jaw line and temples (off-label, but your provider will assess your needs and goals to recommend the best product and placement for you. Using filler 'off-label' is a common practice and not a reason for concern. Click here to learn more. Facial fillers like JUVÉDERM® Vollure XC work by placing a long lasting gel deep in the tissue. It adds support to areas of volume loss which adds subtle smoothness and gives a more youthful appearance. The JUVÉDERM® Vollure XC product will also pull moisture to the area adding to the volume and lift. Although you might experience some discomfort during and after the injection treatment, it is rare due to the combined use of topical cream anesthetic and the anesthetic which is mixed into the filler to reduce injection site pain. Most experience minimal discomfort. During the treatment, you can expect to a feeling of pressure, not pain, as the gel is injected. It may feel “heavy” in the injected area. You may also hear sounds as the needle passes through the various facial tissues. Sometimes those sounds are like popping and/or crunching. This is normal. If at any time during the treatment you feel you need a break or feel lightheaded tell your provider. 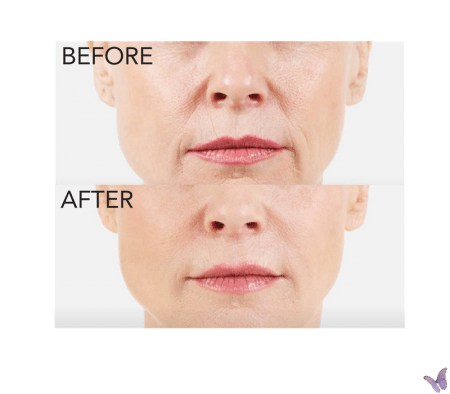 How long is the Juvederm Vollure appointment? The treatment itself is brief. Depending upon the areas to be addressed and the number of syringes of product used, the actual injections may take from 15 minutes to 1 hour. If your provider applies a topical numbing cream to the area before treatment that may add 20-45 minutes to the appointment. Correction is temporary but long lasting (up to 18 months). The results are immediate. The product is naturally broken down and absorbed by the body over time. Touch-up injections and repeat injections are usually needed to maintain optimal correction. The good news is with regular touch-ups, less material (about half the amount) is usually needed for repeat injections. How many treatments of Juvederm Volluredo I need? Only one treatment is required to achieve optimal results but remember, correction is temporary. The product will naturally break down and be absorbed by the body over time. Touch-up injections as well as repeat injections are usually needed to maintain the effects. When you have repeat injections, usually less material (about half the amount) is needed. How do I prepare for my Juvederm Vollure appointment? Prior to the appointment you will remove all makeup or the provider will do it for you. The skin is prepped with an antiseptic topically to prevent the introduction of bacteria during the injections. What should I do or expect post Juvederm Vollure treatment? Do not exercise strenuously, or have extensive sun or heat exposure (like hot tubs or saunas), and drink alcoholic beverages for 24 hours. This helps to prevent temporary redness, swelling, and/or itching of the injection sites. Your provider may advise you to place an ice pack over any swollen areas. Ask your provider when makeup may be used after your treatment. What are the common risks, side effect or concerns with Juvederm Vollure? What are the costs and payment options for Juvederm Vollure?